Russia´s far east has always fascinated me. The vastness and remoteness of this enormous area makes Scandinavia´s deepest wilderness seem like an urban park. And there is fish there, too: lots of weird and beautiful salmonid species, many of them unique to the area, as well as other interesting species. And there is very little real intel to be found online. I stumbled upon this exciting website called Fly Fishing Russia the other day, and I thought I´d share it with you. 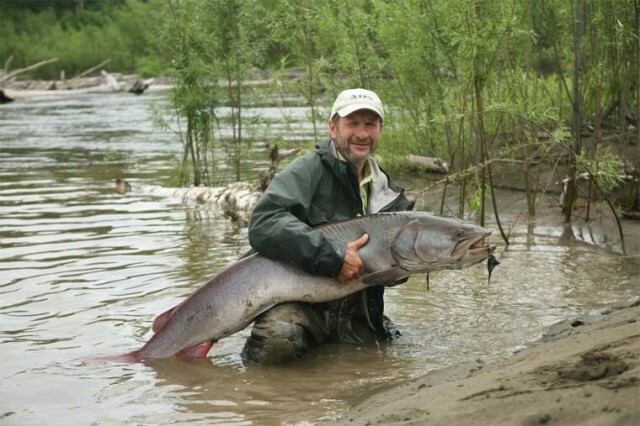 The blog is run by fish biologist/flyfisherman Mikhail Skopets, and deals with, well, fly fishing in Russia. Highly recommended – check it out! Thats a hog! A barn door! Lets go! Fredrik: Kan jag ha sett dig i Luleå igår (25 Januari)? Eller såg jag i syne? Funderade på att springa efter ?dig?och skrika ut min uppskattning men det blev aldrig av. In Luleå? I was in Stockholm that day but it seems like I have a twin brother!? Did I carry a fly rod? Är ditt riktiga namn Nilz? Nu blir jag nyfiken! Looking beyond Russia lies South Korea and the fly fishing there, its great. Our guide told us that our initial destination was the Yedang Reservoir south of Seoul, the capital. I never heard of it but it is the largest freshwater fishing lake in the country with many tributaries. The trip took us through some of the most beautiful mountains and streams that I’ve ever seen. We were told by our fly fishing guide that we would be fly fishing for “Lenok Trout”, it’s a Mongolian fish that looks like a Golden trout. That´s really interesting, Cary! We´ll keep that in mind – we´ve been talking about a trip to Japan, and Korea isn´t all that far away.